With 8,000 attendees in person and 2,000 on the waitlist, this was the biggest KubeCon ever. 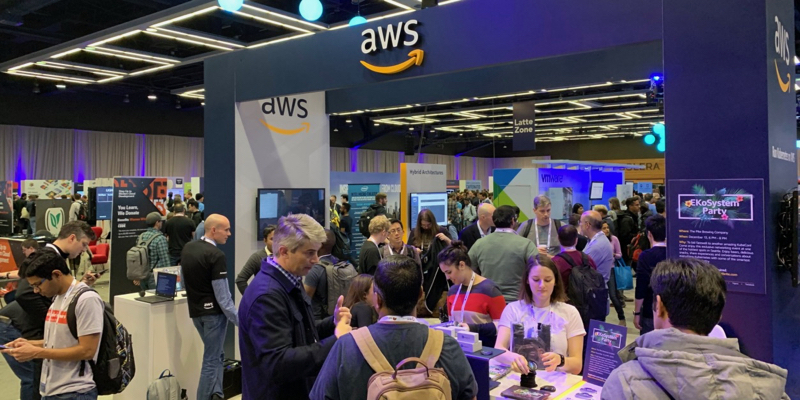 Amazon Web Services was a Diamond sponsor, and this was another great opportunity to meet our customers on the exhibitor floor, in the hallways, in the social events, and throughout the conference. There were a number of hot topics to discuss. Amazon Elastic Container Service for Kubernetes (Amazon EKS), our managed Kubernetes service, is growing at an incredibly fast pace, with huge interest from customers. A couple of weeks earlier at re:Invent, we had announced a public preview of AWS App Mesh, which allows you to easily monitor and control microservices running on AWS. AppMesh can be integrated with Amazon Elastic Container Service (Amazon ECS) and Amazon EKS using the open source Envoy proxy. Firecracker, also announced at re:Invent, is an open source virtualization technology that makes it possible to provision secure and multitenant microVMs for serverless computing, whether containers or functions. We had deep technical discussions with the Kata Containers and Containerd teams to discuss Firecracker integration. You can follow the Firecracker and Containerd integration in the GitHub repo. During KubeCon, it was announced that etcd is now a CNCF incubating project. The Observability Practitioners Summit is a new one-day conference focused on observability and monitoring. Adrian Cockcroft gave the opening talk Who Watches the Watchers? on bringing chaos engineering principles to observability, as that becomes a critical part of the overall need for resilience. The KubeSec Enterprise Summit focused on the challenges faced by larger organizations in meeting demanding security and compliance requirements deploying Kubernetes in production. Chris Hein, AWS Partner Solutions Architect, gave a talk on Operations After Deployment: Life with Your Secure Kubernetes Environment. Henrik Johansson (Principal – Office of the CISO, AWS) gave a talk on How Security of the Cloud Helps Secure Containers Workloads in the Cloud. Several members of the Amazon EKS team also participated in the Kubernetes Contributor Summit. Amazon is a customer-obsessed company; 90-95% of our roadmap is driven by customers. To increase transparency with our customers and provide a venue for direct feedback, we also shared a public roadmap from the Container Services team. Kubecon was a great cap to an exciting year in containers at AWS! In 2019, we’ll continue to innovate on behalf of our customers so that you don’t have to do undifferentiated heavy lifting, and can focus on your own applications. Happy Containers New Year!